I have heard from way too many people that even though they know how much art journaling can benefit and impact their lives, they still struggle with the fear of messing things up, letting loose, not feeling good enough, finding joy in the process, or just not being able to start at all. Sound familiar? And if you’re anything like me when I first started exploring the world of art journaling, you’ve probably put in hundreds of hours watching YouTube videos, bought all the “right” supplies, poured over your beautiful magazines and “how-to” books, and perhaps even taken a few art classes… and yet, you’re still feeling stuck. Now what? What if… you were able to find everything you ever needed, right inside of you? So why does it feel so damn hard? Look, I know all too well how easy it is to get caught up in the excitement of art journaling – buying all the new products, delving into the infinite possibilities of techniques, and exploring how other people approach their journal. I mean, ‘come on, it’s total eye candy, I love it too!! But when we get caught up in all of that, we’re caught in our head. And we can’t access our heart or intuition, where authentic expression truly lies. Pile on our social conditioning to rely more on our logical “left brain”, and now we’re really stuck. Let’s face it, the last thing you need is another tutorial or more art supplies. Save those for when you can really use them. For now? I’ve got a free mini series coming up that just might help. 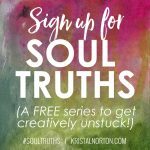 To support you in getting moving on this path toward authentic expression, and in celebration of my yearly class Creative Soul Roots that’s starting soon, I’ll be sharing a series of Soul-Truths that will help you get clear on why you’ve been feeling stuck, and inspiration to start trusting in your Creative Soul once more. 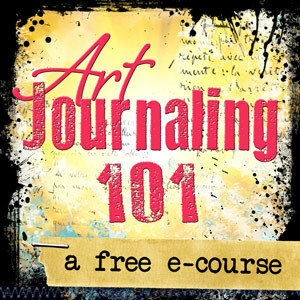 So if you’ve been yearning to express yourself freely in an art journal, but still feeling stuck, not good enough, not knowing where to start, or just not able to find joy in the process, sign up below for this free mini series which starts Monday, Sept 18th.